Rajacenna van Dam creates two pencil-drawn artworks simultaneously, having previously drawn singer Taylor Swift and actress Selena Gomez in a YouTube timelapse video. It has been a success, with views piling up on a YouTube timelapse video of the 25-year-old artist drawing singer Taylor Swift and actress Selena Gomez simultaneously. "I can work faster this way. I don't work twice as fast, but definitely 70 percent faster," she said of her ambidextrous artistry. 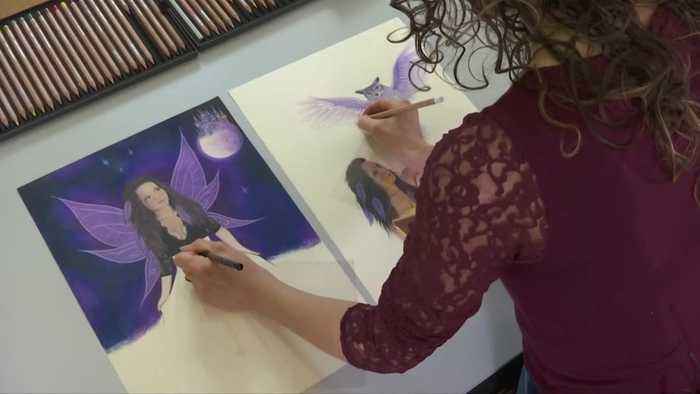 In addition to drawing famous people, she enjoys fantasy drawing scenes and also does commercial work, including a current commission for a line of Spanish merchandise.